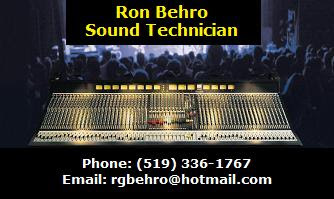 I posted the first design of my sound tech business card on my facebook page and asked for comments, suggestions, etc. My friend Bex from New York, a theatre tech, gave me some suggestions for a redesign. In her opinion the blue background bar with yellow lettering was too distracting. She suggested I just have a black background at the bottom with white lettering. As for the top background and lettering, I decided go with bright yellow letter and black background. The yellow letter really stands out against the black just like bright lights on a dark stage. Take a good look and tell me what you think. Canadian band "MANTECA" is back!